The holidays have ended. We look in the mirror and see the aftermath of one too many Christmas cookies, having just one more slice of ham, or in my case, chugging the gravy boat. Well, ladies and gentlemen, there is NO better way to give yourself incentive to work out and get back in shape than having a bevy of beauties strut their stuff for you! 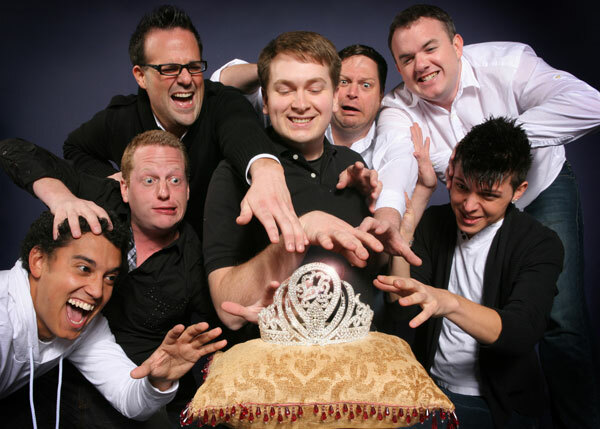 Pageant The Musical is playing at Actor’s Theatre of Charlotte through January 22nd. Pageant is a hilarious spoof of those great beauty contests that later became known as “scholarship competitions”… yeah, right. Six lovely “ladies” compete for the title of Miss Glamouresse in all the classic categories… evening wear, talent, swimsuit, etc., with a panel of judges/audience members deciding on a winner. Oh, the grace, the style, the awkward feeling my dad is hitting the bottle again. Male actors are cast in the roles of the contestants, and while I was a little leery at first, it makes perfect sense. Sure, a guy in a dress is funny, for a little while. With Pageant, the actors are all accomplished comedians, and the script delivers line after line of farcical material. Our Master of Ceremonies for the night is the smarmy Frankie Cavalier, played by Billy Ensley. Billy delivers the smooth, velvet vocals superbly, and keeps the show moving quite nicely. 5 seconds into the show you can’t help but love the little guy. The contestants are winners of their “regions”, and each bring a special sense of stereotypical flair to the stage. Miss Texas (Matt Kenyon) made me think of what Barbara Bush must have been like in the 1950s. Miss Great Plains (Robbie Jaeger) brought the house down (as well as herself) with amazing comedic timing during “I Am the Land”. Miss Bible Belt (Ryan Deal) is “Bankin’ on Jesus” to help her through life, and brought some wonderfully realistic preaching to the stage. Miss Industrial Northeast (Alex Aguilar of the Charlotte Royals) showed off that athletic ability with some top-notch roller skating. No doubt, if things don’t work out in rugby, Alex can always get a gig at Sonic! Miss West Coast (Clay Smith) looked as if she could lend our beloved Carolina Panthers a hand on the offensive line. Clay played the “blond Barbie” roll perfectly, with what I’m guessing is a natural, “dumb guy” look. That brings us to the pageant winner on opening night (each night may be different, it’s up to the individual judges), Miss Deep South (Devin Nystrom). Devin is the smallest of the contestants, and probably has a skinny leg up on the rest of the guys in the “beauty” department. He delivered his lines with impeccable charm, and obviously put a lot of work into his “talent”. While no real threat to Jeff Dunham, it was still a hilarious bit of acting. The second act seemed to plod along a little slower, with less energy. Former Queen Tawny-Jo Johnson (Gray Rikard) joins the cast and tries to add some pizazz, but by this time, we’re all growing a little tired of the “guy in a dress” thing. Director Stuart Williams managed to squeeze an admirable job out of all of the actors. I never really felt a sense of a cohesive cast, as much as I did they were just a bunch of guys doing their own comedic bits, much like a night of stand up. However, that’s exactly what a beauty pageant is, so maybe it was intentional. Technically, the set was adequate, sound lacked a little, but music was well done. Costumes were wonderful, and I’m sure it was no small task to somehow make the audience think of those masculine physiques as feminine. I had another wonderful night out at Actor’s Theatre, and while this particular show is not one of their own, but rather Stuart Williams Productions, in Association with Theatre 650, it still sends the same message. If you want to get out and share some great laughs with friends, without breaking the bank, the hard working folks at ATC are the ones to see! On one chilly night in Charlotte, I was thoroughly entertained by Frankie, Tawny-Jo, and six lovely contestants with “something extra”!